Last week on the Silhouette America blog I talked about a quick and easy way to spruce up a set of Ikea Drawer Units using Silhouette Adhesive Vinyl!! I explain what type of design files I used, the dimensions of these exact drawers and more. If you’d like to read more check out the post! CT’s pirate themed 5th birthday party was a few months ago and I shared one of the crafts we did on the Silhouette America blog! Check the post out for a full tutorial on how I prepped everything! It was a Design Your Own Pirate flag using felt, fabric and paper! It was a huge hit and all the kids made amazing flags!! Silhouette America Creative Team: Call for Applications! Silhouette America is looking for new members for their 2015-16 Creative Team (what was called the Design Team). Applications are open until February 13th and you can find all of the information on their blog, here. You can see some examples of the work I did for them here. Originally I wasn’t going to re-apply because I wanted to go out and try more stuff and didn’t know how that would work with my Silhouette schedule (since I really struggled juggling everything when I was sick this past fall and winter). Now it’s because I will be part of a new design team come April 1st, where the schedule isn’t as packed. I’ll share more the closer it gets. I will continue to post tutorials using my Silhouette CAMEO in the same fashion I did on their blog, so keep an eye out for those! I still have sooooo many ideas! 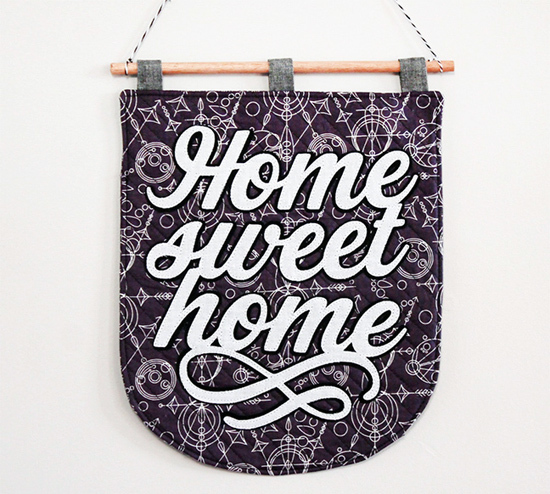 Last month on the Silhouette America blog I shared a very informative post on how I made the above Home Sweet Home banner! The fabric I used is from Alison Glass’ line Sunprint, and is from Andover Fabrics who sent me the fabric to try out! 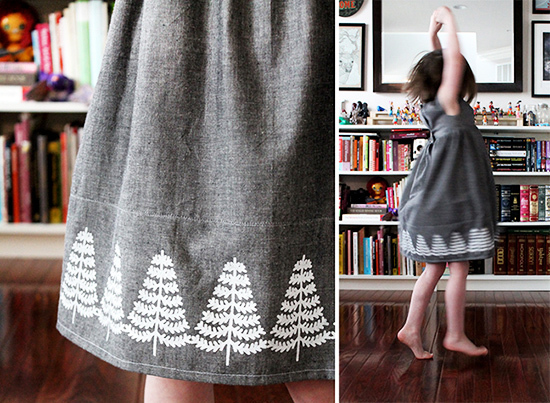 Last week I shared an adorable dress on the Silhouette blog that I made CT. I used their free shape of the day as part of the 12 Days of Christmas Giveaway. It was a cute tree that had a slight Scandinavian look to it. I can only picture it in white for some reason, but I bet it could be used in many ways. I painted a border of them on the bottom of a dress I made using their stencil vinyl. The dress is made using Made By Rae’s Geranium Dress pattern and the fabric is Andover Fabric’s chambray in black. Last week on the Silhouette America blog I shared a few personalized ceramic ornaments I made. I used their Gold Vinyl and $1 ceramic ornaments I found at AC Moore! They are PERFECT gift toppers or small gifts for when you just have way too many family members! They are also great for kids with unique names, so they can have their own personalized ornaments every year. You can see more photos and a full description here.